TV screen “resolution” always refers to the total number of pixels that make up the picture on the TV screen. The higher the screen resolution, the more detail the picture can produce. Today’s TVs have from a few hundred thousand pixels to 33 million pixels on a screen. One pixel = one tiny dot on the screen. We will list the different TV types, TV resolutions, specifications, and the total pixels for each. A higher resolution usually means a better TV. However the resolution is not the only factor involved in picture quality. Factors such as contrast ratio, size of screen, and how close you are to the actual screen are very important. TV contrast ratio is defined as the ratio of the luminance of the brightest color (white) to that of the darkest color (black). This is the luminance ratio that the TV is capable of producing. A higher contrast ratio is a desired aspect of any TV. A larger TV screen will give you much more viewing area. A typical 65″ inch HDTV screen has about 40 percent more viewing area than a 55″ inch HDTV screen. Remember that TV screen sizes are measured diagonally and not horizontally across the TV screen. Question: What is the difference in resolution and pixels between a 1080p and a 4K TV? Answer: A 4K HDTV screen is 3840 pixels across by 2160 down. 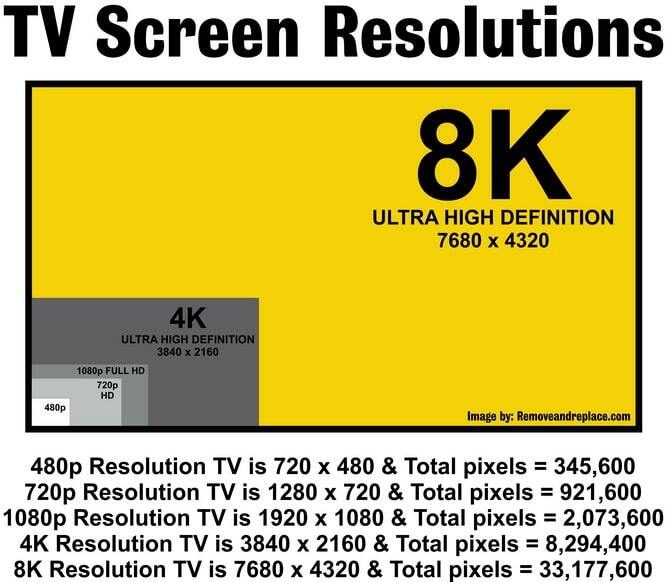 That means 8,294,400 pixels which is 4 times the resolution of a 1080p TV. Question: What does the “p” after the resolution number mean? Answer: The “p” means “progressive”, if there is an “i” after the number, it means “interlaced”. Question: Which is better, 1080p or 1080i? Answer: 1080i is split into 2 interlaced fields of 540 lines while 1080p is not. Question: My cable transmits in 1080, will it look ok on a 4k screen? Answer: If you have 4k resolution, your TV should be able to upscale it to look as good as possible. Question: Will a 720p TV be able to show the detail of 1080p content? Answer: No, you will lose detail if you watch 1080p content on a 720p TV. Question: How many pixels make up a 4K HDTV? Answer: A 4K HDTV has 8,294,400 pixels. Just multiply the numbers 3840 x 2160 as this is the number of pixels across and down. Question: Is 720 High Definition? Answer: A 720p HDTV has 720 lines of pixels and is considered high definition but lower than today’s standard. Question: Can you notice the difference between a 720p TV and a 1080p TV if sitting 10 feet away? Answer: If you are sitting more than 8 feet away from a TV screen, chances are you won’t be able to tell the difference between 720 and 1080. Question: The cable box gives me the option to choose 720p or 1080i, does it matter what I set it to? Answer: It is better to set the cable box the the higher resolution setting, use 1080i over 720p. Question: My Playstation gives me the option to set the resolution, is 1080p better than 1080i? Answer: If you have a 1080 HDTV, set your Playstation to use the 1080p as it should look better on the screen than 1080i. Question: Will a Blu-Ray Disc played on a 720p screen look as good as on a 1080p since it is blu-ray? Answer: Blu-ray format will look better than a normal DVD but will not be able to show actual 1080p quality on a 720p TV. Question: I watch a lot of sports and my new LED TV makes it blur when there is constant motion, can I adjust something? Answer: LED TVs don’t look quite as good for motion or sports than compared to OLED TVs. Adjust the picture setting to “Sports”. Question: Should I sit closer to my new LED TV to see more detail than my old Plasma TV? Answer: LCD, LED, and OLED TVs do not have scan lines. They have ultra crisp and detailed screens.. so you can sit closer. Question: I seem to see pixels on my TV, I have a 720p and it is not very detailed. Can I fix this? Answer: Be sure the screen settings on your TV are set to high, if that does not work, try sitting a little further away. Question: What is OLED? Is that similar to an LED TV but with something extra? Answer: An OLED TV means = Organic Light Emitting Diode. OLED combines the best qualities of plasma and LCD together. Question: Does an OLED TV have a backlight? Answer: An OLED TV is self illuminating and needs no backlight. Do you have questions about TV screen resolutions? Please leave a comment or question below and we will assist. I understand that the pixel size is defined by the number of pixels verses the size of screen they are applied to. What is the smallest pixel size (in micron I presume) available currently? I guess this would be the high resolution on the smallest commercial screen? I am just interested in the range between the smallest and largest individual pixel sizes currently used. Presumably there is a manufacturing limitation in size?